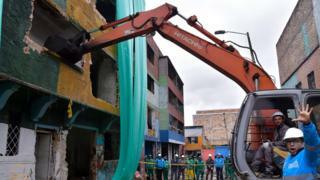 The authorities in the Colombian capital, Bogota, have begun demolishing a notorious district in the centre of the city called the Bronx. The area had become a focus for drug addicts, criminals and prostitution. Bogota's mayor said the area would be turned into a new commercial sector. In May security forces sent in to clear the area found scores of children who had been forced into prostitution, and hundred of drug addicts. They also discovered a tunnel used by traffickers which ran from a house to a local shop. Local people argue the problem of street crime has not been solved as many of the former dwellers of the Bronx are now roaming around the centre of town or have been starting to concentrate in other areas of the capital, the BBC's Natalio Cosoy reports from Bogota.